Marigny Street. I am not even sure how to begin telling you about this story… It’s a love story. It has a paranormal flavor… It’s unexpected and rather unusual and yet… I was completely enveloped. I read it in one sitting. And a day later I’m still thinking about Eva and Gabriel’s story. Marigny Street is where Eva lives in New Orleans. She’s always been a dreamer and grown up in a family that believes in the power of dreams. But Eva has suffered a tragedy and is just sleepwalking through life. Gabriel is a movie star who doesn’t dream. When they meet it’s like magic. I loved the prose in this story, the tactile descriptions of New Orleans, crawfish and hurricanes, the streetcars and fireflies, the heat and rain. You could practically taste the food and feel the steam. And amidst this beautiful city two people, who met once upon a dream, reconnect, with who they are and with each other. Gabriel has buttoned down his emotions and is trapped by expectations and Eva is lost and fading from this world. I thought I would be judgy of their situation but I wasn’t. I was too wrapped up in their dance, in their emotions. I ached for these characters. I wanted them to find a way to make a future together. I loved how the storytelling was richly detailed and colorful and emotional. I read a few lines to a friend and she said I was in a sappy mood. 😉 Maybe… but I connected with this story and the way it was told, I wasn’t ready for it to end and I definitely want more Eva and Gabriel! A few of my fav lines… It was hard to pick. I bookmarked so many passages! I don’t think I’ve ever read a story quite like this before. 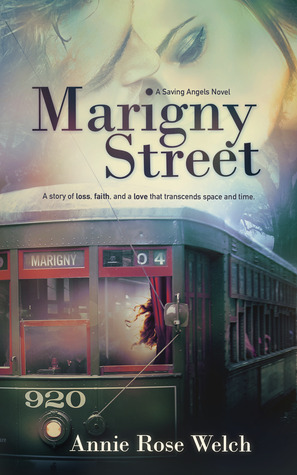 Marigny Street is one of the most beautiful, lyrical, poetic and romantic stories I have ever read. It didn’t give me what I expected… but I put it down feeling like I’d woken from a good dream, thoughtful and hopeful. I immediately went and bought the next book in Annie Rose Welch’s Saving Angels series because I want more of her evocative, romantic storytelling. Previous PostPrevious Spotlight On Marigny Street by Annie Rose Welch + Excerpt + Contest!